Bee pollen is the male seed of a flower blossom which are collected by the honey bees and mixed with the bees’ digestive enzymes. It’s a blend of sticky pollen granules that could contain up to five million pollen spores each. Raved by many scientists as a complete nutrition, a super nutritious, perfect food, these tiny pollens contain almost all the nutrients required by the human body and are enormously rich in proteins, vitamins, minerals, beneficial fatty acids, carotenoids, and bioflavonoids which are anti-viral, antibacterial and helpful in lowering cholesterol, stabilizing and strengthening capillaries. Pollen is the only plant source that contains the exclusive vitamin B12. Fresh pollens contain a wide spectrum of at least 20 amino acids which are the building blocks of protein needed to build every cell in the body, from blood cell to the cells in the skin, organs and bones. There are also more than 100 active enzymes present in fresh and unheated pollens. Eating foods that contain enzymes helps the body prevent and fight diseases such as cancer and arthritis and saves the body from having to make enzymes, a process that depletes energy. Applied to the skin, these pollens are also believed to be helpful in healing wounds and acne. Appreciated for years as an excellent weight control, bee pollen is low in calories and contains natural Phenylalanine which acts as appetite suppressant and Lecithin that helps dissolve and flush fat from the body, that is, detoxification and cleansing. Its ability to rejuvenate the body, stimulates organs, enhances vitality and accelerate rate of recovery makes it a popular home remedy and tonic among athletes and sportsmen. Despite the many thousands of chemical analyses conducted in the laboratory with the most advanced diagnostic technology to create a synthetic version, scientists are still unable to identify some elements present in the pollens. The bees must have added some mysterious goodness of their own that cannot be copied and replaced by any man-made food! 9. Skin Related Ailments, eg ezcema, hives, rashes. High-quality, fresh pollen consists of soft, fragrant, pliable granules that are neither pasteurized nor heated. These tiny yellow, orange, or brown granules can be chewed direct. They also come in the capsule and tablet forms. The taste of pollen varies depending on the flower and nectar source it comes from. Some pollen has a slightly sweet and nut-like flavor, while some pollen tastes bitter. If you try pollen from different sources, you would be surprised how much its taste can vary. 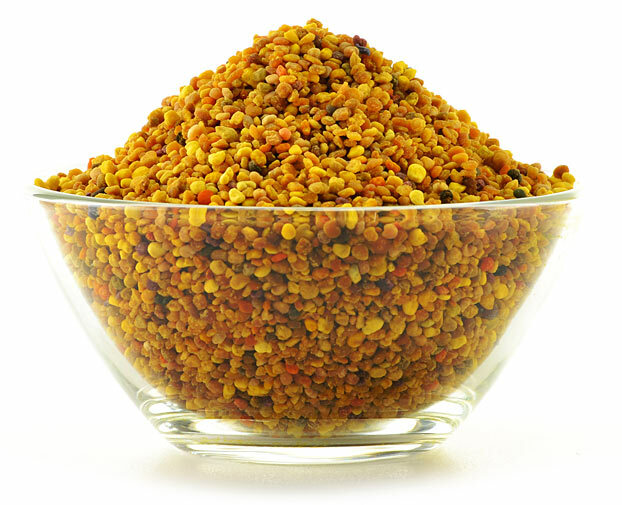 Bee pollen is very versatile; you can choose to mix the granules with any food you like. However, eating it raw is best, never cook it or add it to boiling water or food that requires heating. Heat destroys the live enzymes in the pollen and lowers its nutritional value. Some parents suggest blending it together with fruits to form a delicious smoothie for their young children who would require all the essential amino acids, minerals, vitamins to grow strong and healthy, while others prefer to sprinkle the granules on pancake, toasted waffle, or granola. There are also people who prefer to chew it directly. Many shared with me that their appreciation for pollen is a taste acquired over time. For me, I like to pre-grind small batches of the pollen granules into power form in advance to store so that I can conveniently use half a teaspoon each time I mix a warm chocolate drink (not more than 50 degrees C.). (See a picture of my finely ground pollen above.) Young children tend to fight against the graininess of the pollen initially when it is introduced into their diet, but they gradually come to terms with it after getting used to it and experiencing the benefits for themselves and seeing that they are so much less prone to flu and cold attacks after starting on the pollen. The difference it brings in terms of boosting immunity and strength is too obvious to be ignored. Many kids in fact eventually also realise that pollens are quite fragrant after all! For adults, take 1-2 teaspoons daily and for children, half to a teaspoon daily, at any time of the day. It’s just a guide for newbies to this nutritious food, you can increase the amount to consume as you go along and monitor your body’s response to it. There is no hard and fast rules on how it should be consumed, unlike conventional synthetic drugs and supplements. It can be chewed directly or crushed/ground and mixed with any food (Note: Crushing breaks the hard outer pollen shell and helps ingestion of the pollen). Bee pollen is not the same as allergy causing pollen that is dry, lightweight and is carried easily by the wind. It rarely cause allergy symptoms. However, if you have a concern about developing an allergic reaction, you may want to start with placing just a tiny bit of pollen (a granule or two) under your tongue and monitor if there are any side effects such as itchy throat, tearing eyes, headache. The amount can be gradually increased over time after having assured that the consumption is safe. 11 Ways to Use Honey to Get More Gorgeous Skin, Hair, and Nails.